You’re exposed to mold every day, but what do you really know about it? Is it a plant or an animal? What does it look like? Is all mold toxic? Learn the answers to these questions, and many more, as we explore mold in depth. 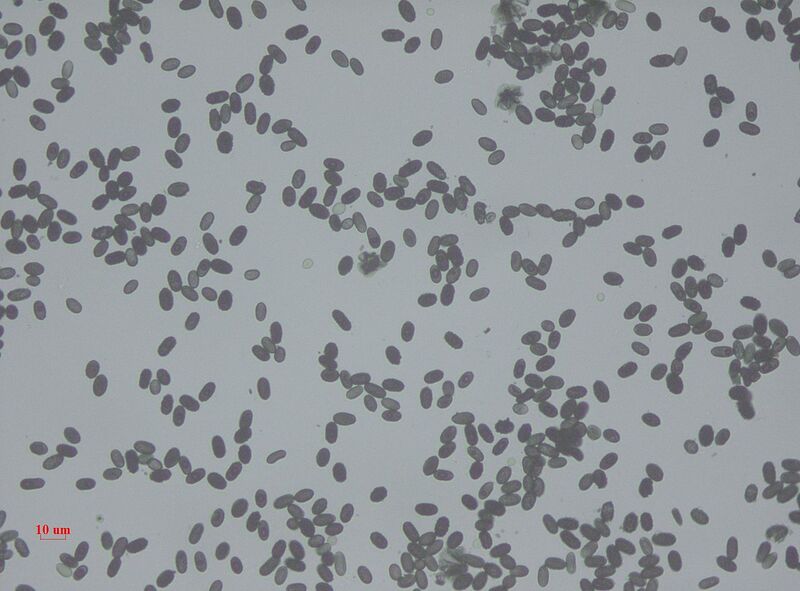 Mold is a type of fungus that grows in multicellular tube-like structures called hyphae. 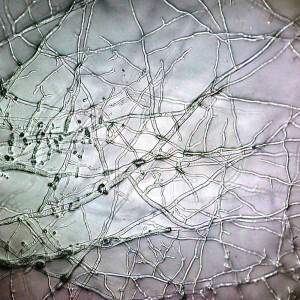 These hyphae grow and branch out into visible colonies, which are considered to be separate living organisms. 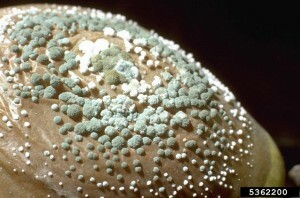 Other organisms in the fungi kingdom include mildew, yeasts, and mushrooms. Molds play an important role in nature. They the speed up the process of natural decomposition by breaking down organic materials like leaves, wood and other plant debris. In other words, mold helps get rid of nature’s trash. How long has mold been around? Molds have been in existence for more than 400 million years—much longer than humans or our ancestors. In fact, all human evolution has occurred in the presence of mold. And even though we’ve been exposed to molds since day one, we have not yet been able to adjust to the molds in our environment. 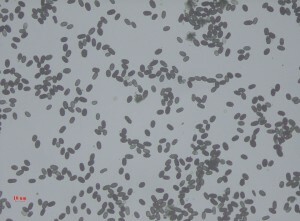 Mold colonies can vary greatly in color, texture, size and shape. The type of mold and where it’s growing will determine the mold’s appearance. Color – Molds come in a rainbow of colors. You’re probably most familiar with the white and green molds you sometimes find on spoiled food, and the black “toxic” mold that everyone talks about. But mold can also be brown, gray, tan, orange, yellow, red, blue, or some combination of those colors. The possibilities are endless! Texture ­– Mold texture can also vary greatly in their texture. Some will appear velvety and soft, while others will appear fluffy, and still others seem grainy, slimy or spongey. It all depends on the type of mold and the surface it’s growing on. 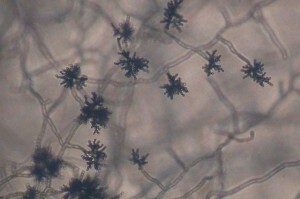 Molds reproduce by producing and releasing spores into the air. These tiny mold spores can be found just about anywhere because they are spread through the air. They act like seeds in that mold spores will start to reproduce wherever they land, so long as the environment meets two very simple needs: it provides moisture and a food source. When mold spores start to reproduce, they will start to feed on and digest whatever material they’re growing on. While often mistaken for plants, mold cannot produce energy from sunlight like plants do. Instead, they must consume organic materials. But molds are not picky eaters. While mold species vary in their preferences, they’ll eat just about anything to survive. 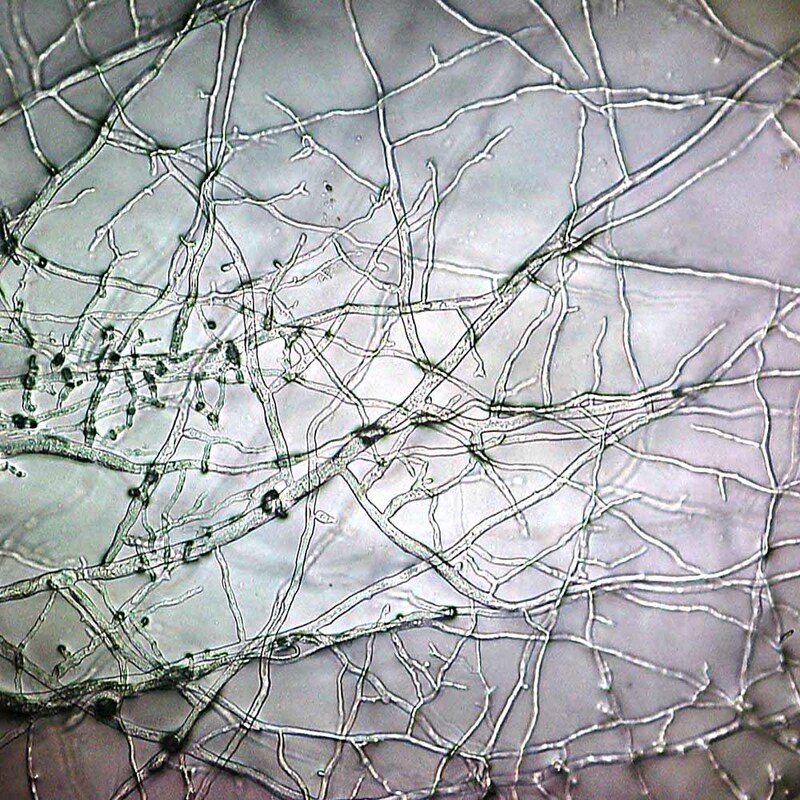 They are able to absorb nutrients from the material of their choice through a mass of branching hyphae called mycelium (see picture to the right). In nature, molds help break down plant materials, plant waste, and other organic materials. But if mold spores make their way indoors, they’ll start to feed on whatever food source is available, including human food, building materials, and sometimes every human tissue. In these cases, molds’ healthy appetite can lead to some serious health effects and unrepairable damage to building materials and furnishings. So in short, mold becomes a problem any time it starts growing indoors. But this is hard to prevent when mold spores are easily able to make their way indoors and start feeding on just about anything. Unfortunately, construction practices have only added to the problem in recent years. First, better-insulated buildings have lowered opportunities for natural ventilation and made it easier for moisture to become trapped inside buildings. Increased use of cheap, moisture-sensitive materials like drywall and plywood has compounded the problem because they readily absorb moisture. The combination of moisture-laden building materials and inadequate ventilation have created an ideal environment for mold growth in many modern buildings. Alternaria is a common allergenic mold found growing in think green, black or gray colonies indoors. Alternaria molds often cause allergy or hay fever symptoms in humans, and in some cases exposure can lead to the development of asthma. 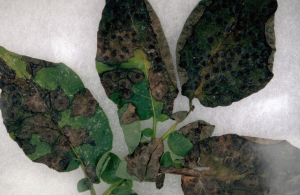 While they are most pathogenic to plants, some Alternaria species have been known to cause infections in immunocompromised individuals. Aspergillus is another common indoor mold most often found growing in warm, damp climates. 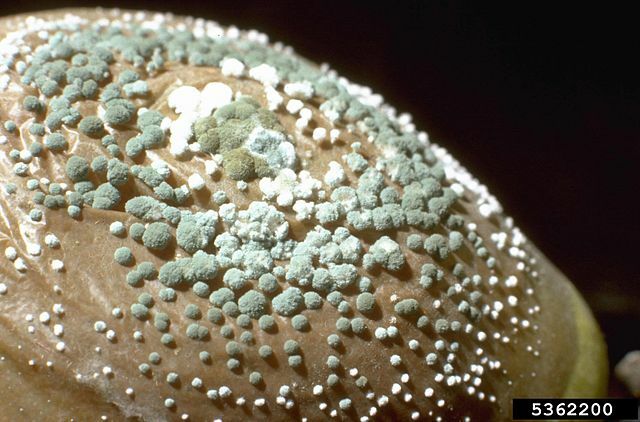 Aspergillus species are most commonly found decaying leaves, trees and starchy crops outdoors, but they also tend to take up residence indoors wherever dust can be found, including air conditioning and heating ducts. 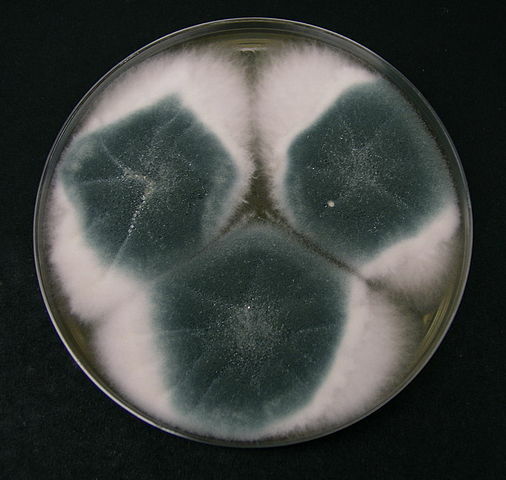 Aspergillus molds produce chemical compounds called mycotoxins that are poisonous to humans. If immunocompromised people inhale the mold spores, Aspergillus can take up residence in the lungs and cause serious lung infections and aspergillosis, among other health issues. Cladosporium is a common outdoor mold that can be found growing on both living and dead plant materials. When airborne spores make their way inside, Cladosporium molds will grow in green, black or brown colonies on damp, porous materials like wood and textiles. These molds can sometimes cause skin, sinus and pulmonary infections, but the most serious health effects are caused by airborne Cladosporium spores. These spores are major allergens for humans and can cause severe asthma and allergy symptoms. While this genre of mold does not produce mycotoxins, they do emit Volatile Organic Compounds (VOCs) that cause strong musty odors. Penicillium is best known for its applications in medicine and food production. Several Penicillium mold species produce the mycotoxin penicillin, which is used as an antibiotic to kill bacteria. Some species are also used to cure meats and cheeses. But regular exposure to penicillin molds can cause allergy and asthma symptoms. Penicillium molds are most often found growing on water-damaged materials in buildings, including fabrics, carpets, wallpaper, and insulation materials. Stachybotrys is a toxigenic mold that is commonly found growing on wood, wallpaper and other moisture-sensitive building materials because it needs a steady source of moisture to grow. For this reason, Stachybotrys mold growth is often used as an indicator of water damage or a bigger moisture problem. When most people refer to “toxic black mold,” they are talking about Stachybotrys because it is usually dark greenish-black color. While Stachybotrys is not the most toxic mold, it is probably the most well known because it has been associated with many serious health effects, including: burning eyes, headache, nausea, nose bleeds, allergic reactions, asthma, exhaustion, sinus infections, cognitive disorders, pulmonary hemorrhage, liver damage, central nervous system damage, brain damage, some cancers and even death.